Rescuers found an astonishing 172 cats inside a New Jersey home. Roseanne Colletti reports. More than 170 cats were rescued from a rural property in New Jersey where they were living in dire conditions with no electricity or running water, officials say. 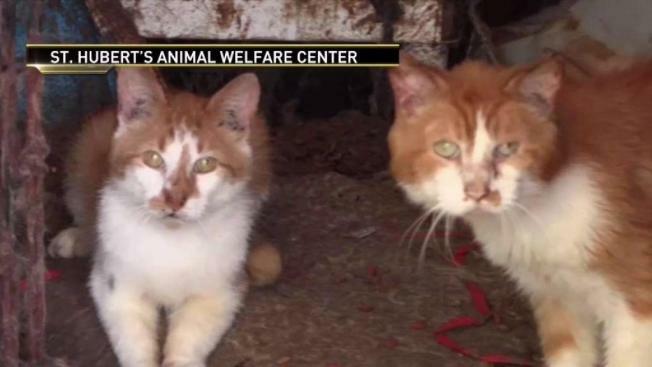 The felines -- 172 in all -- were found found in a Sussex County home last week, St. Hubert’s Animal Welfare Center announced. Incredibly, they all belonged to a single owner: an elderly man who was overwhelmed after the death of his wife two years ago. The home and property were the felines were found fell into disrepair and did not have electricity or running water. St. Hubert's said it assessed the situation and with the cooperation of the property owner and concerned neighbors agreed to take custody and responsibility for the cats, most of which were in fairly good condition. Af few required some extra care. "One of the things were seeing is a number of is kitties like this fella here who have something called entropia, in which the eyelids roll in and the eyelashes rub on the eyes causing discomfort," said veterinarian Karen Dashfield, as she held one of the cats. "So we’re going to have to do surgical fixes." All of the cats rescued have been vaccinated, dewormed and treated for fleas. They'll also be spayed or neutered before being rehomed. The cats will be put up for adoption soon, but the rescue warns that not all of them will make good house pets because they're skittish around people. They could make for good barn cats, however. It is not immediately clear if any charges will be filed.